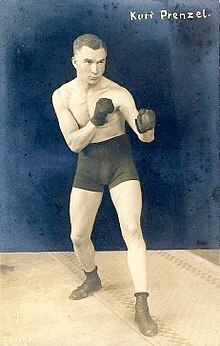 Kurt Prenzel, boxer of the 1920s, displaying orthodox stance with left hand and left foot to the fore. The corresponding designation for a left-handed boxer is southpaw and is generally a mirror image of the orthodox stance. A southpaw boxer guards and jabs with his right hand. Some famous boxers who use southpaw are Marvelous Marvin Hagler, Tyson Fury, Victor Ortiz, Sultan Ibragimov, Naseem Hamed, Joe Calzaghe, Manny Pacquiao, and Lucian Bute. Francisco Palacios, Andre Ward, and Terence Crawford normally fight as orthodox, but occasionally switch to a southpaw stance to confuse their opponents. Hagler was the opposite, normally fighting southpaw but able to switch to orthodox. Some fighters who are naturally left-handed fight in the orthodox stance with the advantage of a fast, hard jab and left hook, including Oscar De La Hoya, Miguel Angel Cotto, Gerry Cooney, and Marco Antonio Barrera. Likewise, Vasyl Lomachenko is a naturally right-handed fighter who stands in the southpaw stance. This page was last edited on 9 February 2019, at 23:41 (UTC).